A self taught silversmith, whose roots originate from a farm in Nebraska. Otto, who had visited his grandfather to visit the 1940 World's Fair, realized that he did not want to pursue the life of a farmer so, in 1941, he went to New York to discover his future. He answered just one employment ad and showed up for the interview. Frank (Francisco) Rebajes explained that he was looking for someone to take his studio art pieces and increase production capability. He said to Otto "See what you can do" and handed Otto one of his favorite pieces, the "Ubangi Face". At the end of the day Frank was amazed. Otto had created some jigs and a process to mass produce Franks art. 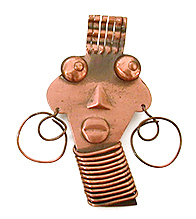 Otto made in just one day, one hundred perfect Ubangi Face sculptured pins. Frank knew then that his dream to provide wearable art to the masses would now be realized. 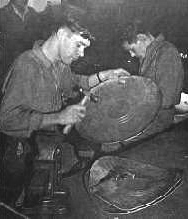 Frank Rebajes was considered the first master in the art of copper jewelry and crafts and Otto was the Foreman that insured the designs were artfully and masterfully produced. More importantly Frank and Otto enjoyed a friendship that would last a lifetime. Rebajes Wearable Art was one of the top Jewelry producers in the 1940s and 50s with hundreds of top stores accross the nation carrying the line. 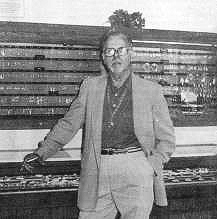 Otto, now with decades of silversmithing skills left the company and started his own business "Orb Originals" in 1958 with much success. Frank sold the Rebajes name and business to Otto in 1960 and moved to Spain where he returned to small studio work and his scientific research of the "Mobius". With Otto's business growing, he had added the workshop, machinery, and catalog designs from Rebajes. Business kept on growing and going quite well, until in 1981, when Otto was held up and severely pistol whipped leaving him in critical condition. After a long recovery from the injuries, Otto and his wife Dae moved to New Hope, PA.
Orb Silvermiths remains a staple to the community of New Hope, PA to this day. Otto, now well into his nineties, is still instrumental in ensuring that the Rebajes hallmark carries on with the traditions and craftsmanship that made the Rebajes name so famous and sought after for over eighty years. Credit: Otto R. Bade, Brian Hoffner, & DonWilby "Businesses come and go but Orb remains." New Hope Gazette. July 11, 1996.